Super Defense Nasal Filters offer you a physical solution to block pollen, dust, dander, and mold allergens out of your respiratory airway. Super Defense Nasal Filters protect you from pollen & grass allergies and offer you an opportunity to feel the freshness of nature again. Super Defense Nasal Filters block 97% of pet hair, dander & mold to protect you from allergies of your cute puppies and kitties. Super Defense Nasal Filters filter out 97% dust, 90% germs and 90% PM 2.5 like ordinary masks, however it won't cover your face making you feel stuffy meanwhile it won't mess up your makeups. The size of nasal cavity is different from size of nose. First-time buyers are highly recommended to order the multi-size pack(S/M/L) to find the most suitable size. Remove a pair of filters from the silver plastic bag. One side of the filter is net and the other side is fiber. Install a pair of replacement filter into each frame with its net side facing you. Then install the black retainer ring into each frame. The filter and black retainer ring should now be secured by the frame tabs. 1. How do I know which size is correct for my nose? Size is very important to ensure the filter's efficacy and durability. Please refer to the following Sizing Instruction. Please refer to the Round Vs. Slotted Nostril image to decide if you need round or slotted(narrow and long) size series. First-time buyers are recommended to order the multi-size pack-Round (S/M/L/XL) or multi-size pack-Slotted (S/M/L/XL). If you need a suggestion from us, please kindly send the picture of your nostrils to us. 2. 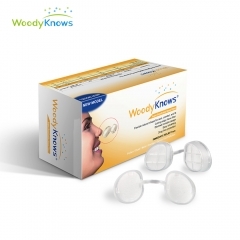 What's the difference among all the WoodyKnows Nasal Filters? If you are very sensitive to breathability, Ultra Breathable is highly recommended to you. If you need the best protection, Super Defense Max(New Release) is recommended to you. If you need protection for second-hand smoke, vehicle exhaust, TVOC, Gas and Pollutant Reducing is recommended to you. 3. How should I clean the nasal filter? Is it disposable? The frame of the nasal filter is easy to rinse and reusable. Please wash it with soap water or 70% alcohol every day and dry it in the shade. The replacement filters are disposable and need changing every 1-3 days. 4. Can the frame of Super Defense work with Ultra Breathable/Gas and Pollutant Reducing/Super Defense Max replacement filters? Yes. 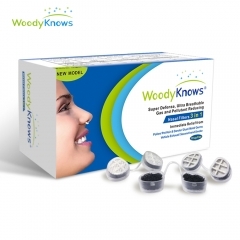 All of WoodyKnows nasal filters are made of same frames but different replacement filters. If the replacement filter's size is same as that of the frame, they can work together perfectly. 5. Can Super Defense work for smells, for example perfumes? 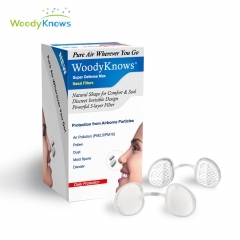 Gas and Pollutant Reducing Nasal Filter works for the toxins from the bad smells. The product received some positive feedbacks according to our customers who have MCS(Multiple Chemical Sensitivity). Please be noticed that the nasal filter can NOT remove all the smells. Your sense of smell won't stop working unless something can totally block all the air and smells which means you can't breathe through your nose. 6. Will my nose shape alter after wearing it? No. it won't. The nasal filter is designed according to the natural shape of your nostrils for your comfort and fit with very soft plastic, BPA- , Phthalate- and Latex free. The filter should be a little bit bigger than your nasal passage for a better seal. When you take the nasal filter off, your nose will return to its shape as usual. 7. Where can I find the size chart? The size of your nostrils are different from that of your nose. Please do NOT choose size according to your outer nose size. The Length*Width*Height(mm) of all the sizes are as below(measured manually with deviation). 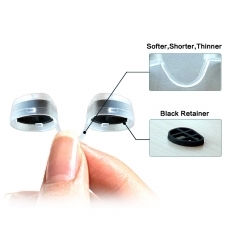 S Round Nasal filter:12*10*6, M Round Nasal filter:13*11*6. 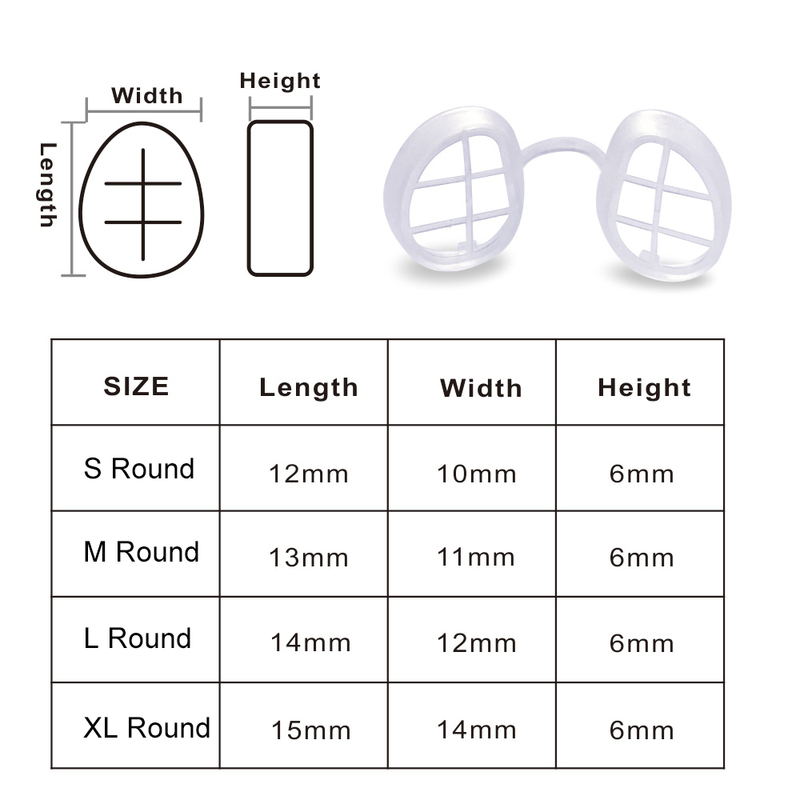 L Round Nasal filter:14*12*6, XL Round Nasal filter:15*14*6. 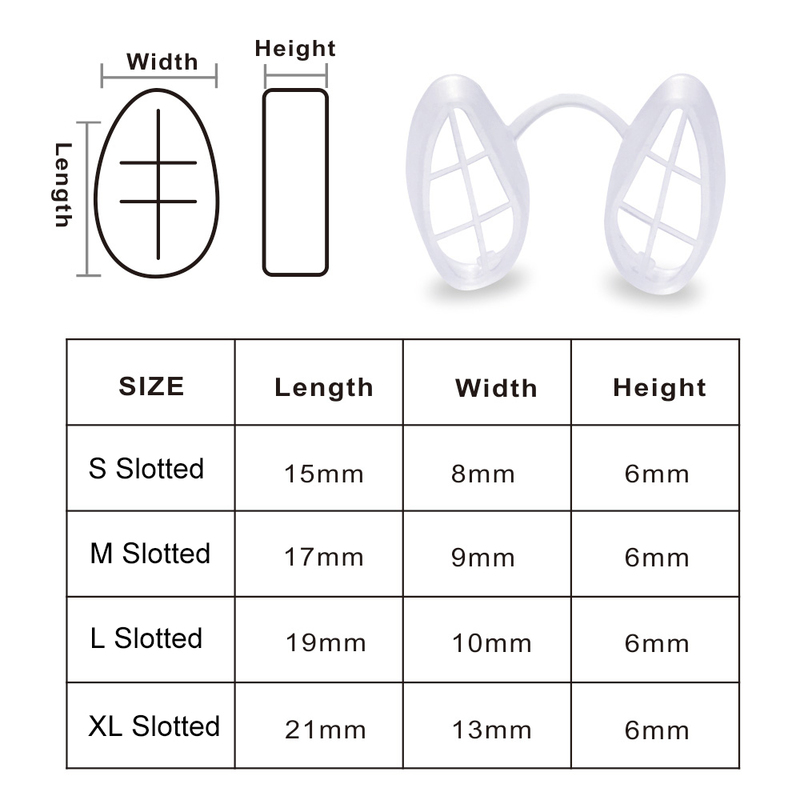 S Slotted Nasal filter:15*8*6, M Slotted Nasal filter:17*9*6. L Slotted Nasal filter:19*10*6, XL Slotted Nasal filter:21*13*6. My nose is so sensitive that I could get a job sniffing luggage at the airport. I drive my friends and family nearly insane because I'm always saying, "Do you smell that?" and of course they do not. I have a lifetime, inherited, serious allergy to molds. Also, due to chronic chemical occupational exposure I have many, many environmental 'allergies'. (Chemical sensitivities as it was explained to me, although my body doesn't seem to care about what correct terminology is used. My mold allergies are so bad that my uvula swells, chronic nasal/sinus problems, long standing medicinal interventions including most recently, Decadron. I searched and found THESE. The idea here is that it stops the allergens before it reaches your nose. I put these in a little over a week ago and found nearly instant RELIEF. I sleep with them in. YES, they do take some getting use to but medications take a toll on your body. This morning I woke up for the first time in YEARS and did not have purple/blue rings and bags under my eyes!!! Try them. Just try them. Order the one with the three different sizes so you can try them all then wear it and order a whole box full of filters and you will come back on here and thank me. :D Do it for you, do it for your family. Do it for your mental health. Being in constant inflammation due to allergies is bad for you and a rotten way to live. I STILL LOVE THESE. Seriously. They provide me with INSTANT relief. Two examples: We have mold in the apartment walls where we live, (long story), now with winter coming and windows being closed, I notice I am having symptoms again unless I put these in. I sleep with these in and don't wake up with all the ..phlegm. I was cleaning the house yesterday and I'm sure anyone with these problems can relate. Moving anything from under the bed and vacuuming under there will make my sinuses feel like they have HOT LAVA in them. So I went and put my nasal filters in and within about 15 minutes my headache started to subside and my nasal symptoms went away. I've just placed my order for yet another box of filters. I LOVE THIS PRODUCT. Seriously if you suffer and suffer like I do and the long acting OTC medications either aren't an option or just don't cover you and you are TIRED of taking the antihistamine roller coaster, PLEASE try these. This is truly such an excellent product. I have severe nasal allergies and I can go along through my day thinking I'm just fine and then in the next moment I'll be somewhere and get just a small exposure to some whiff of mold or preservative or who knows what and WHAM there goes my throat and nose. I take a Benadryl and then pop these in and I'm better. I've learned now to just wear them 24hrs a day this time of the year. I carry a spare in my purse in case I'm off and have trouble while traveling. Also, I have a very sensitive nose so I thought these would irritate my skin but they do not. Most the time I forget I have them in. My teenagers say I look like I have a nose ring so they think it's cool. Do yourself a favor and just give this a try. It's chemical free and who needs more chemicals. Very happy and agony free! I am very happy with the results I have had from using the Super Defense Filters. 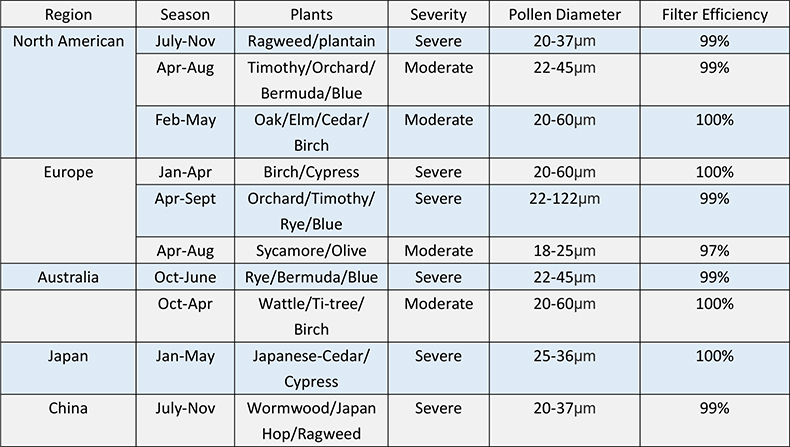 I had started wearing an N95 particle mask when allergies started this year, a few weeks ago here in New England. As a wearer of glasses, these masks can be a major pain, with the fogging, and glasses not sitting right. I had no sooner been lamenting to a friend that someone should make a small mask type thing that just covers the nostrils when lo and behold I stumbled upon (ok, I searched for them) the variety of products available on Amazon. After perusing for a couple days, I decided to give the Woody's a try. Soooo glad I did. Almost immediately I noticed relief from the sinus pressure that comes with my allergic reaction. I started with the size trial pack (A great idea considering the importance of getting the right fit) and after only one day knew that this was going to make a difference. I ordered a 2 pack in my size and a box of 24 filters. They have been very effective. As soon as I start to feel a pollen reaction coming on, I pop 'em in and head it off. Small price to pay for not feeling like I have a tooth ache in every tooth on my upper right side, with an earache thrown in for good measure. One word of caution, the frame material is soft (therefore comfortable), and the bridge is subject to wear if you pinch them too much when adjusting or removing them. (Try to avoid the instinct to use your fingernails to grab them.) I have found that I can get them partially dislodged, enough to remove them easily, with a couple good "huffs" outward with one side covered. It lets you grab it by the actual frame instead of the bridge. Or I suppose you could use the plastic tweezers that come with it to assist in grabbing the frame instead of the bridge, in addition to their intended use in changing filters.